Are these tools in your music therapy bag? Whether you travel to your clients or they come to you, you’ve probably noticed that you reach for many of the same items over and over (and over!) again from session to session when working with kids. So what are those items exactly? What are your must-haves? 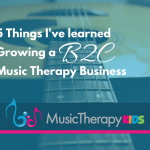 If you are a student or a newer music therapist, you might have limited funds to apply toward growing your music therapy library and want to know how to get the best bang for your buck. 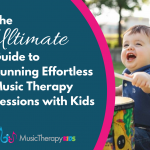 If you’re a seasoned music therapist, you might be wondering how to streamline your process or if you are using the items that are best practice. 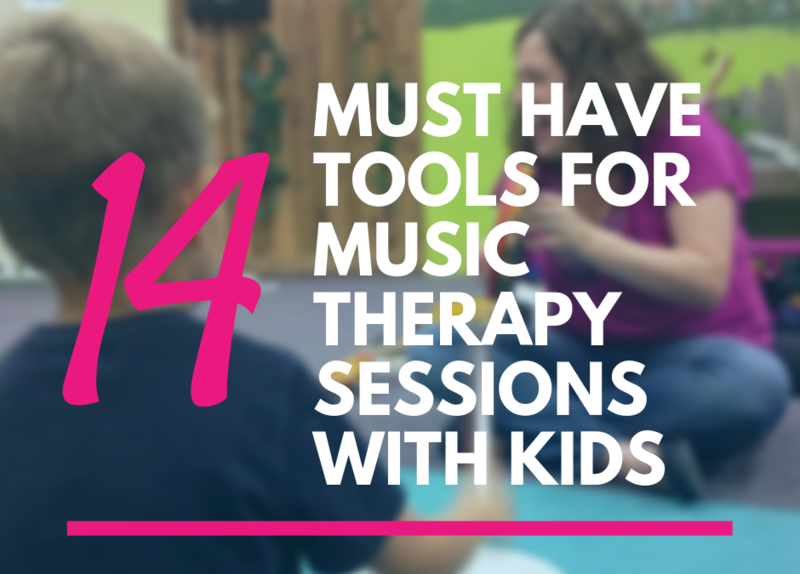 Well, I don’t know about everyone else, but today I am sharing *my* top 14 tools for music therapy sessions with kids! My list covers everything from visuals to instruments and equipment. As a music therapist, this is a no brainer. You need to accompany yourself in some fashion. At the beginning of my music therapy career I assumed that guitar was *the* go to instrument but I’ve discovered that it varies around the world. So whatever instrument makes you comfy: guitar, ukulele, autoharp, piano, [insert your instrument here], you NEED a quality case, preferably one you can wear on your back. One of the first investments I made during my internship was a backpack guitar case. We were *always* on the move and not only did I need to protect my guitar, I needed to free my hands to carry all the other things we transported. 2. an awesome MT bag that makes you happy! Do you like a little bit of sparkle? Bright colors? Earth tones? You have to look at the bag you use allllll day so my best suggestion is to purchase something that is both practical and pretty. I happen to like the organizing utility tote from 31 Bags. I’m a teal and bright color kind of gal so I smile almost every time I see my navy bag with teal polka dots! In the Facebook group Professional Success with Music Therapy Ed, Kat and team hosted a music therapy bag share day – Here’s the group and from there search #mtbag. Go be inspired!! Moment of total honesty. I don’t own one! BUT if I could change one thing from when I first started out, I would have purchased a laminator in a heartbeat. When I need to laminate visuals, I have typically relied on help from the schools where I provide services or I would go to a local educational store who has great prices for laminating. But I lament all the time and trips I could have saved over the years! Recently one of the music therapists on our team brought her laminator to our center to share and it has been glorious! Looks like purchasing one is on my list for the near future! Try as we may to provide mostly live music, there will be times when you need to amplify a recording or maybe even amplify your voice. Having a great bluetooth speaker is essential. I’ve tried a few over the years but get what works with your budget and needs! We could probably go on for days about which are the greatest apps to use but without the iPad, none of it is possible. Even though this is a pricey item, it’s totally worth it. Start saving or ask your family to pitch in together for a stellar Christmas or birthday gift. I use mine all. the. time. Are you using singable books? They are the best, right? Colorful and engaging visuals already created for you AND set to music. It doesn’t get any better than that! And there is no one better suited to bring these books to life than MUSIC THERAPISTS! This is a definite must have. It should probably even be higher on the list! We know that many of our kids respond well to consistency and structure. These items can help you with that! You can set up your schedule however you want. For readers, I might simply write the schedule on a portable white board. For visual learners, I use a picture to represent each activity. Token boards also vary. One of our team members created this one. She used a variety of character themed tokens and rewards to go along with it! One of my team members suggested this as a go to tool. I’ve had Twinkle Little Star memorized for so long that I almost forgot there was a time when I didn’t have it memorized!! Once you have all the classics memorized, you can easily adapt them for a variety of goals or just use the tunes as you improvise songs in the moment. I prefer the Chiquita kind with a handle. And lots of them. Why the handle? Having a handle removes the choking risk that can come along with typical egg shakers. I have purchased various kinds over the years and have found that many maracas are too loud for my kids, especially when 10 children each have one. The Chiquitas have a quiet sound and are easy to clean. I love all types of drums, but when I’m out and about, I reach for paddle drums. The thin design allows me to place a couple effortlessly in my bag. They are kid and teen friendly. They make a great sound and will last for years. What’s not to love? They most fantastic part about having a stretchy band OR a parachute is that most songs can use either item with a couple minor lyric adaptations! Either of these items will be a favorite and frequently requested among your groups. Need to wake up a sleepy group? Need to practice following directions in a highly motivating setting? Need to work on preposition and location words? The parachute or stretchy band has you covered! Playing Chiquitas every week can get a little boring so I like to switch it up with jingle bells! They are little less friendly to being cleaned so I carefully watch my clients who might want to place them in their mouth. Another crowd favorite. These are easy to wash in a laundry bag, are lightweight and easy to transport. Kids adore them. And you can work on SO many goals! 14. join the Music Therapy Kids Songswap!! The final recommendation I will make is a bit self serving but I’m not ashamed to tell you about this resource! 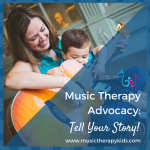 If you are looking for fresh inspiration and ideas that have been field tested by other music therapists, then you need to join the Music Therapy Kids Songswap. This is a FREE 4 week challenge. We share weekly interventions around a variety of broad themes and participants who contribute all four weeks will receive an organized list that will allow you to keep your newly expanded rep at your fingertips.We have run the songswap several times in the past and it is a blast every time! Don’t delay because we get started October 19th! So that wraps up my top must-haves. Now it’s your turn. What can’t you live without? Same as me? Totally different? Let me know – mary@musictherapykids.com. P.S. What are you waiting for? Join songswap NOW!